I turn 40 soon. No big deal. Except this is the first time I’ve been aware of age (well since being young enough that quarter years mattered). So I figure I’m due some sort of mid-life crisis. Of course, life is actually pretty good. I did the quit my job and do something crazy about 15 years ago, I’m pretty good with a Frisbee and I’ve spent the last 3 years living and working from different locations around the globe, so there’s not much to rebel against. So I have a plan. Well more accurately I stole the plan from the indubitable Head of Blue at SKChase (thanks Kris). 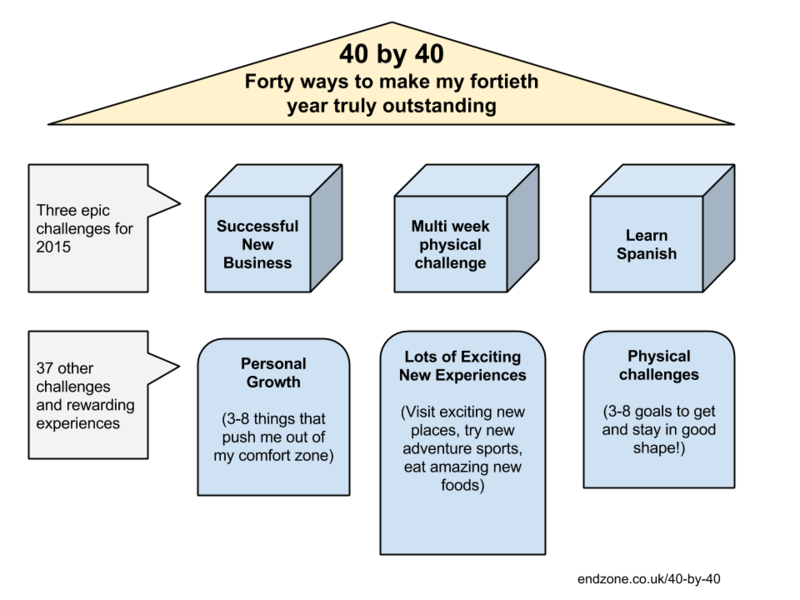 My 40th year is going to be an outstanding year full of challenges and new experiences. I’m going to grow as a person, rack up some great new memories and generally get on with making life awesome. Three “Epics”: These are big things which are going to take huge effort across the year. Build my new business (which is stubbornly placing my values front and centre rather than just profits), finally work on learning a second language and an epic physical challenge (which is likely to be a multi-week event around Oct). A number of personal growth challenges: things that force me out of my comfort zone and therefore possibly open new doors in life. These will require some time & effort and thus be more than “make that phone call you’ve been putting off for weeks” type of things. And finally, each month I will search out new experiences. Just fun things, places, activities; small stuff that adds up to an fun life. All these will add up to 40 and exactly what each thing is, well, time will tell. “It’s all about the taking part”. Looking forward to hearing about the progress and developments of your 40th year Barry. I need to get my 40 4 40 back on track.